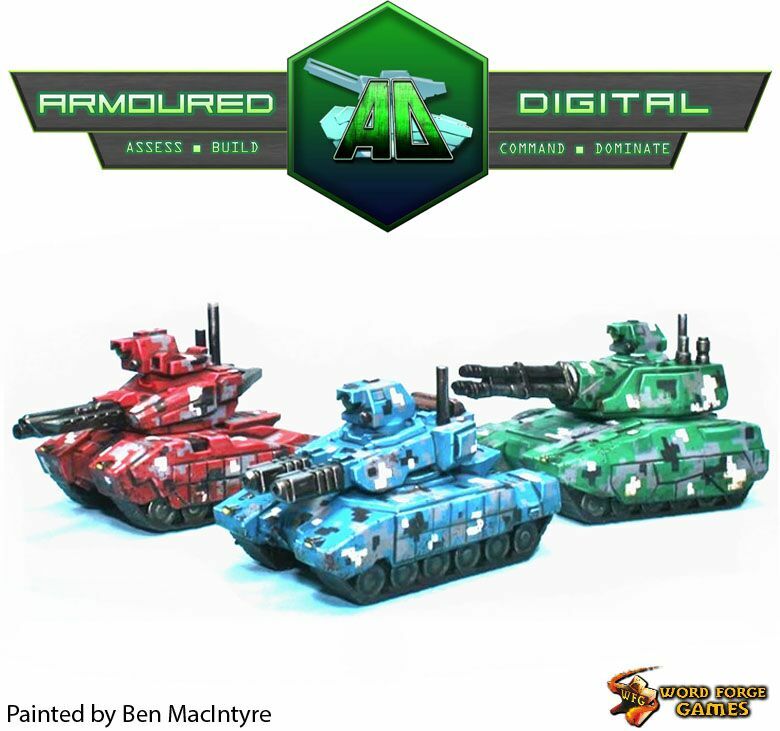 It’s been a little while since Games vs Play spoke with Chris Reynolds, lead designer of the new tactical miniatures game Armoured Digital. We caught up again with Chris to see how he and the Digipath troops are travelling as the game is about to go to Kickstarter. 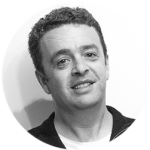 Games vs Play: Hi Chris, great to talk with you again. 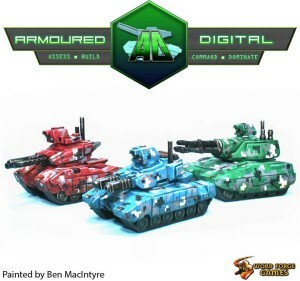 Your game Armoured Digital is only one week away from the Kickstarter launch – which is great by the way, congratulations! Can you tell us again a little bit about what the game is about? Chris Reynolds: Sure! 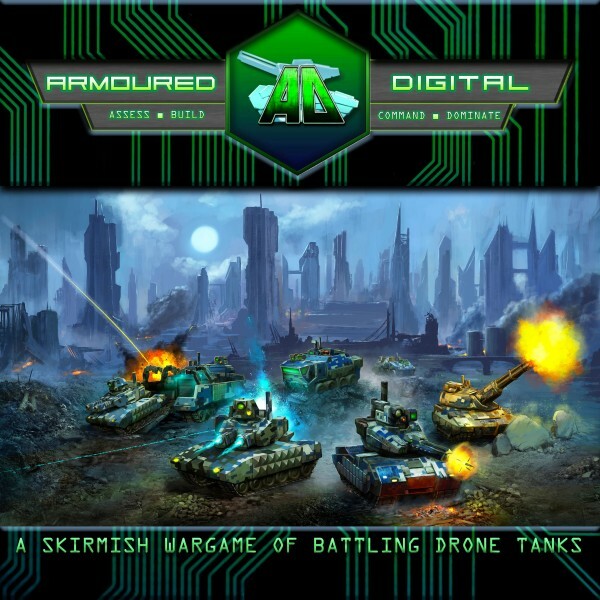 Armoured Digital is a tabletop miniatures skirmish wargame that features drone tanks, programmed orders and building new units during the game. Players take on the role of a Digipath commander, a human with a specialised brain structure that allows them to reprogram computers instinctively and at the speed of thought. 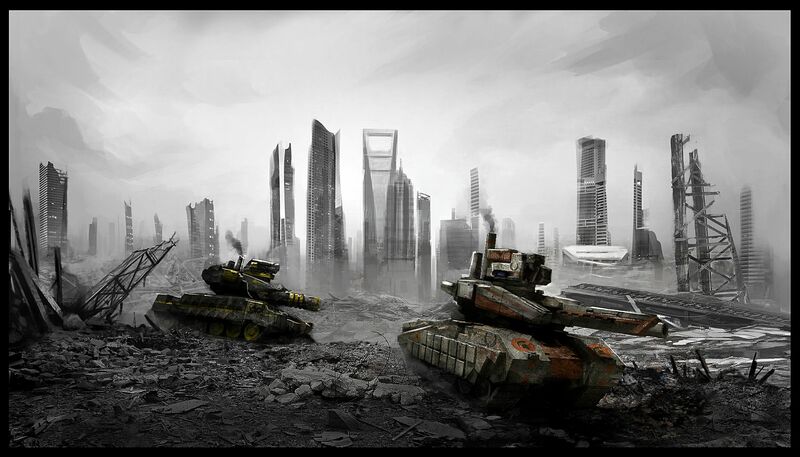 Each player’s Digipath sends their drone tanks into battle for control of an automated mine and the surrounding area. GvP: The name of the game has changed name since we last spoke. Can you tell us what it’s called now, and why you decided to change it? We later changed the name to Absolute Decimation, but it didn’t really capture the feel of the game in one hit, and it also led to some interesting (but not necessarily helpful) discussion about whether the definition of the word ‘decimation’ had changed since ancient Roman times. 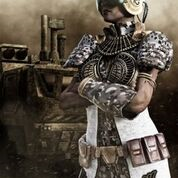 Armoured Digital really captures the essence of what the game is about and hopefully communicates what we are all about to people who haven’t heard of it before. GvP: So what have been some of the other major changes to the game? Chris: We had some delays while the publisher invested in their capacity, and during that time we have been playtesting and demo-ing relentlessly. We’ve added a range of new features and refined existing ones through playtesting. 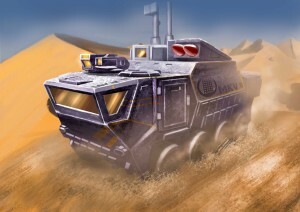 From the first public demonstrations and playtests we did, we’ve added a new command unit, altered the core orders deck to include more ‘electronic warfare’ cards, added features like ejecting commanders and having them walk around on foot, and added rules for both crashing into enemy vehicles and driving off cliffs to land on them. It’s also allowed us to playtest the first few units that will be used as stretch goals during the campaign, as well as a whole pile of new orders that players can expand their core deck with. With everything we’ve added, we’ve kept to a tight set of principles: everything added must enhance the core experience, additional rules should not add too much complexity to the game, and everything must remain in balance so that no one tactic dominates. GvP: It sounds like you’ve had quite a journey bringing this game to life. Looking back what was the single biggest challenge you had to deal with? Chris: When you’ve got a strong central idea, both in terms of the fluff and the gameplay mechanics, it can really drive you along and make it all work. It also means that obstacles are usually a whole lot of little things that can cause friction but not really halt your game’s development. However, the one biggest issue that I have had has been communication. My publisher, Word Forge Games, is based in the UK, the playtesters and myself in Canberra, my miniatures designer is in the US and the artists are from a range of places across the world. Organising timezones, understanding these different people in different places when you can’t talk to them face to face and day to day has led to a range of misunderstandings that always take time to clear it up. And that’s even with the good fortune that I’ve got a great bunch of people to work with! GvP: Now that it’s ready to go to Kickstarter, what would you say is the most unique thing about Armoured Digital that makes it stand out as a tactical miniatures game? Chris: The two main things are the activation sequence and building new units. It’s really a dead heat between the two. The activation sequence uses orders cards (representing the programs that you send to your drones), which a player gathers in a hand and then plays over the course of the turn, alternating with their opponent. Instead of the number of units being the driving factor in how much fighting power you can bring to bear, we use the attention and mental capacity of the Digipath as your meter for each turn. The building of new units is also pretty unique. I’ve heard of maybe one other miniatures board game where this is a thing, and that’s a fantasy game rather than sci-fi. 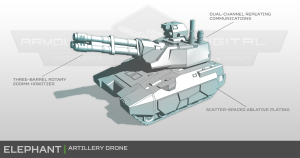 Building units is a very common thing in RTS computer games, but not so much on the tabletop. Building new units mid-game is a great way to keep both players in the fight right to the end, but it also opens up a whole new set of tactics you can employ … like altering your force mix to counter your opponent, or pulling a surprise move and bringing out a unit that the enemy can’t easily counter. GvP: Can you tell us what’s included in the Kickstarter? Chris: The main pledge level on the Kickstarter will be for our two-player starter. This is a complete boxed game that includes 13 miniatures (an automated mine and two forces consisting of a command vehicle, mobile factory, transport vehicle and three combat tanks per side), an orders deck, a rulebook, dice and tokens and all other required elements like stat cards, etc. The box set can be used by two players, or kept by just one player if they want to expand their collection. One of the great things about AD is that no matter which faction you want to collect, all the game’s units are available to you. There will also be levels in there for both players who only want to dip a toe in the water and collect one or two tanks, or players who want all in and want to create their own commander or orders program. All going well, once the main game box is unlocked, we will be expanding the range of units and add-on packs that will be available. There will also be a couple of commanders and orders cards exclusive to the Kickstarter campaign, and a couple more that will only be available to members of our mailing list. GvP: And finally, what plans do you have to market the game after the Kickstarter finishes? Chris: We’re hoping that this will be only the beginning of AD’s life out in game stores across the world! AD is designed for distribution, so retailers are encouraged to be a part of our journey as much as players. We’re also hoping that once the game is out in the wild, there will be reviewers who pick it up and can check out the unique mechanics for themselves. We also have big plans for the game itself! After the initial launch, there is a list of more than 50 new units that we will start to playtest, design and launch over time. 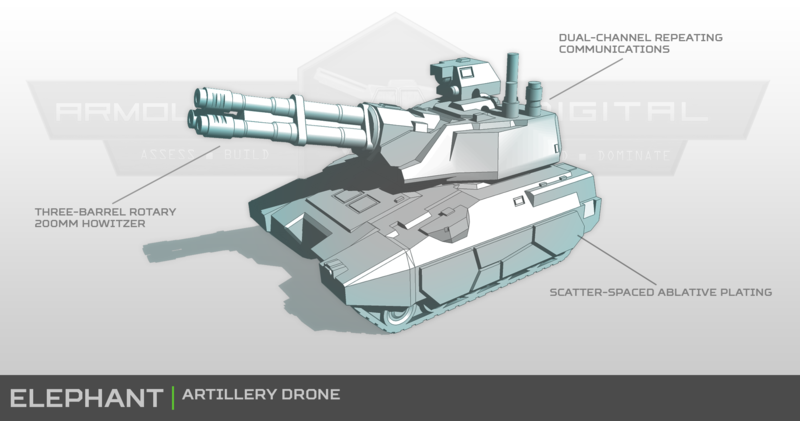 Alongside the tanks from the main game will be hovercraft, insect-like walkers, aircraft and superheavy units. There will be new game modes and campaign systems launched. There will be organised events that will bring together players from across the globe. Armoured Digital will be launched on Kickstarter on Tuesday 27 March 2018. For more details you can join the Armoured Digital mailing list here, or follow Chris and the team on Facebook and Twitter. You can also check out an online demo on Steam. 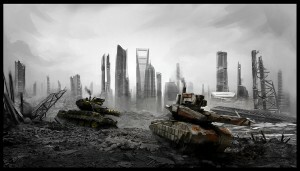 All images courtesy of Armoured Digital and Word Forge Games.